Archbishop Wood # 22 Daeshon Shepherd reacts as Moon celebrates in the background after the Archbishop Wood vs. Mars H.S. PIAA Class 5A boys' basketball state championship game at the Giant Center in Hershey, Pa. on March 22, 2019. Archbishop Wood lost the game 74-64. 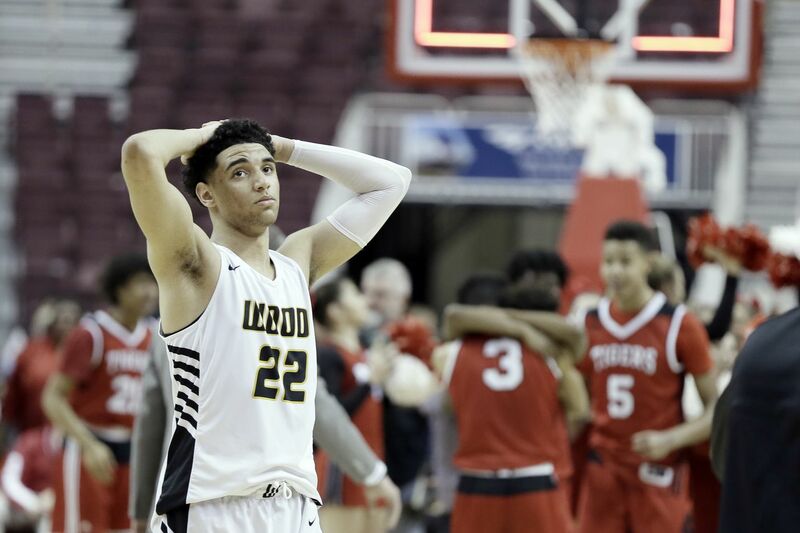 HERSHEY, Pa. -- There are no moral victories in Hershey, but the inexperienced Vikings from Archbishop Wood briefly eclipsed Moon late in the second half before a devastating descent at the Giant Center in Hershey. District 7 Moon, a team led by four senior starters, came from behind in the fourth quarter and won the PIAA Class 5A championship, 74-64. Wood, the District 12 top seed with just one senior on its roster, took a seven-point edge into the final frame before faltering late. Senior guard Connor Ryan led the Tigers (27-2) with 28 points, including 17 in the final frame. Fellow senior guard Jioni Smith finished with eight points, a game-high 11 assists, seven rebounds, two steals and two blocks. The Tigers outscored Wood, 30-13, in the fourth. Archbishop Wood # 1 Julius Phillips and Moonâ€™s # 21 Devonte Humphries go for a loose ball in the first half of the Archbishop Wood vs. Mars H.S. PIAA Class 5A boys' basketball state championship game at the Giant Center in Hershey, Pa. on March 22, 2019. Wood had taken a 51-44 edge into the final frame and added two more early after senior Julius Phillips tipped in a miss. Sophomores Daeshon Shepherd and Rahsool Diggins led the Vikings (19-9) with 22 and 20 points, respectively. The pair even connected on an alley-oop launched near halfcourt from Diggins into the hands of Shepherd, who dunked the ball with authority. On Wood’s previous possession, Diggins had thrown a similar lob pass just out of Shepherd’s reach, resulting in a turnover. Shepherd added eight rebounds, five on the offensive side. Diggins finished 8-of-23 overall, 0-of-6 from three. He added six rebounds, four assists, and three steals. Wood finished with 19 offensive rebounds. The Vikings used defensive pressure late in the third to turn a four-point deficit with 2 minutes, 48 seconds left in the quarter into a seven-point lead. W: Julius Phillips 7, Rahsool Diggins 20, Jaylen Stinson 12, Muneer Newton 3, Daeshon Shepperd 22.